Would you love to fly into SFO, OAK, or SJC and have your cleaned, gassed, and tuned Porsche 914-6 waiting curbside? Do you have too many cars and could use some off-site storage? We would like to introduce to you our full-service garage in Hayward, CA. 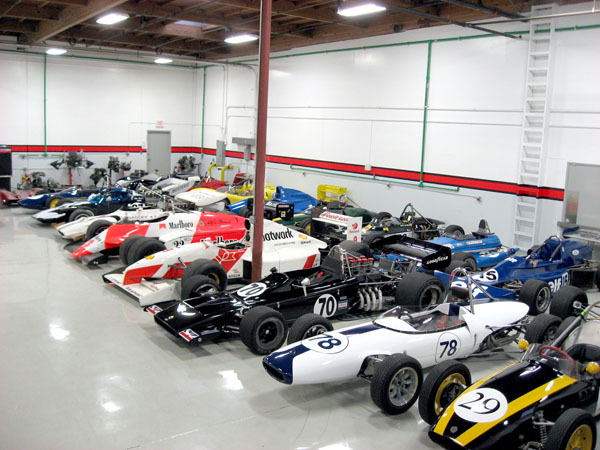 Be it a Porsche 914-6 or your Lotus 49 racecar, we have a space for you. Basic $225 Basic storage service, with access during regular hours on weekdays, notice for access is required. In and out privileges limited to 2 times per month. No indoor car exchange parking. Ideal for storing cars in transit, non-operable vehicles, or any vehicle that will see limited use for an extended period of time. Access outside normal business hours requires an appointment, is subject to availability and additional charges will apply. Enhanced $250 Our next level of storage service includes unlimited in and out privileges and indoor car exchange parking. Drive in your regular car, park securely indoors, and drive home in your special car. Call ahead and your special car will be started, warmed up and ready for you. Return during normal business hours and your regular car will be waiting. Access during extended hours and weekends by appointment, additional charges may apply. Premium $300 As with enhanced, with the addition of Vital Signs services. Your car will be started bi-weekly, tire pressures maintained and your battery charged. Includes 1 Fuel service (fuel charges not included) and 2 weekend or after hours access times per month at no charge. 24 hour access available at additional charge with security deposit, background check and contract. Normal business hours are 9 AM to 6:00 PM Monday through Friday. Weekend access is available by appointment only with an additional service charge. After hours charges apply to access times outside of those listed above. After-hours access $20/use AS above, for times before or after business hours. Car exchange parking, indoor $10/day Available on a daily basis for customers with basic services, included with premium and enhanced packages. Car exchange parking, outdoor Free Outdoor parking is always available in our secure, controlled-access monitored lot for our customers at no charge. Delivery service TBD We can deliver your car for your use anywhere in the Bay area. Charges based on distance, time of day, delivery method, bridge tolls and return transport arrangements for our staff. Please inquire. Tire, battery and start Free We can offer air and jump start service as a courtesy if your car needs attention. Persistent recurring use of this service will incur a charge. Fuel service $10/use For your convenience, our staff will fill your tank when your car returns so it is ready for you next time. Maintenance and repairs TBD Mechanical and body repairs can be arranged on-site with Virtuoso Performance, one of the leading specialty car service organizations in the Bay area. Service appointment valet TBD If your car is covered under a dealer warranty, we can deliver and pick up for scheduled maintenance and warranty repairs. Please inquire. Our garage is a service focused on: reasonable cost, security, pre-purchase inspection and storage services, and (again) reasonable cost. We are a world-class organization with jaw-dropping capabilities (we supported 28 cars in the paddock at the Monterey Motorsports Reunion this year, for instance), and together we’ve created an offering that hits the sweet-spot in terms of what it can offer our readers. From basic storage to premium services, transport logistics to airport pickups, we are ready to turn many a classic car dream into reality. If interested, please contact us at sales@vprace.com. Copyright © 1994-2019 Virtuoso Performance. All Rights Reserved.